Window air conditioning units are one of the most popular ways to cool a room in the USA. More than 6 Million units are sold each year. The price is a big reason for this with the average price between $125-$600. They also deliver a low cost way to cool a space without the high cost of hiring a HVAC company. The performance of these units can vary widely along with efficiency. Installation is relatively simple by setting the unit in a window and securing it with brackets. Some large units can weigh around 85 pounds. If this is a problem than there are portable units that are made for a easier setup. Frigidaire makes many good units with the FRA052XT7 being a economical model. It is small 13.2 x 16 x 12 inches and weighs 35 pounds. A standard 115 volt wall outlet it used to power the unit. The capacity is 5,000 BTU which is rated to cool a 150 square foot room. This is a good unit for those on a budget looking for a low cost option. 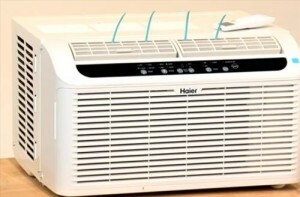 Haier is another top window A/C unit manufacture. Their Serenity Series units are made to be quiet. While all window air conditioners will make some noise the Serenity Series is built to be the quietest possible while still pushing out cold air. They do this by wrapping the noisy compressor in a noise suppression blanket and a fan designed to spin quietly. 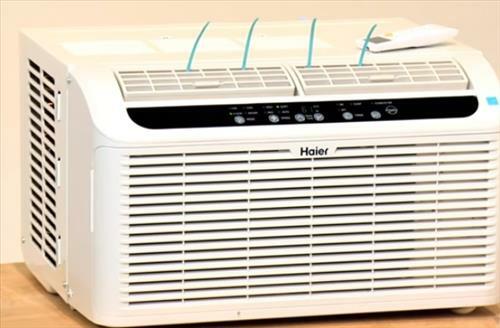 The Haier ESAQ408P is a 8000 BTU that can cool a room up-to 350 square feet and uses a 115 volt power outlet. If you are looking for a good unit that doesn’t make a lot of racket than the Haier ESAQ408P is a good unit to look at. 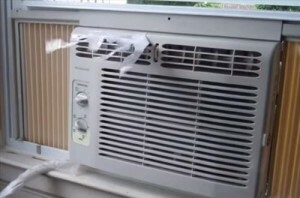 Conventional window A/C units can be difficult for some to setup. Portable air conditioners are a easy to setup and simply require a hose be fed out a window. 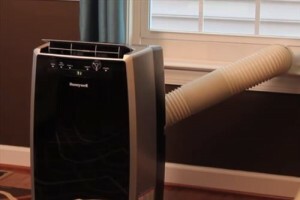 They also have many other uses since they are portable and can be used in a emergency or taken from one room to another in a way that a standard window unit would not be able to. The Honeywell MN10CESWW is 10,000 BTU unit that cools a space up-to 350 square feet. It comes with everything needed including the hose which hot air is pumped out of. Reading multiple reviews is often the best way to shop for any item before buying. Sites such as Amazon or forums give user feedback that can help when making decision easier on which unit to get. Portable units are not often thought of as a option but do a good job in cooling a room along with the added benefit of being easy to setup and easy to store away. If a conventional model is bought than be sure to have help when installing the unit as some can be heavy and weigh between 35 and 85 pounds. Do you have any thoughts on good or bad window air conditioning units? Let us know in the comments below.